Continuing a long-standing New Year’s tradition, today we present an up-to-date list of the world’s most-visited BitTorrent sites. At the start of 2014 The Pirate Bay continues to pull in the most visitors, followed by KickassTorrents and Torrentz. Household name isoHunt.com disappears after settling with the MPAA, but its replacement isoHunt.to is one of this year's newcomers. With 2013 now behind us, which torrent sites are pulling in the most visitors at the start of 2014? Update: the 2015 top torrent sites list is here. Traditionally, BitTorrent users are very loyal, which is reflected in the top 10 where most sites have had a consistent listing for more than half a decade. 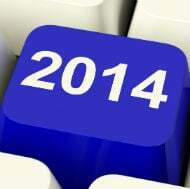 But in common with every year, 2014 sees a few movers and shakers, as well as several newcomers. The top three slots remain intact compared to last year, with The Pirate Bay in the lead despite several domain name changes. The most notable absentee this year is isoHunt. The site has been featured in the top 10 since 2006, but went offline in 2013 after it settled its legal dispute with the MPAA for $110 million. Last year’s newcomer H33t also fell out of the top 10 after it lost its domain name. The site relaunched after two months downtime at H33t.to but has lost most of its traffic. The first newcomer in the top 10 this year is YIFY-Torrents, which is also one of the youngest torrent sites after being founded in 2011. The site has grown tremendously over recent months, and by focusing on popular movie releases YIFY has evolved into Hollywood’s new nemesis. Isohunt clone/replacement isoHunt.to is the second newcomer, which is quite an achievement since the site only launched two months ago. RARBG is the last ‘new’ name, the site has been around for many years but is listed in the top 10 for the first time. Below is the full list of the top 10 most-visited torrent sites at the start of the new year. Only public and English language content sites are included. The list is based on various traffic reports and we display the Alexa and U.S. Compete rank for each. In addition, we include last year’s ranking for each of the 10 sites. People who want to increase their privacy may want to use a proxy or VPN service. To many people The Pirate Bay is synonymous with BitTorrent. The site was founded more than a decade ago and is still expanding, despite various legal troubles, domain hops and ISP blockades. The Pirate Bay currently has well over a billion page views a month. KickassTorrents was founded in 2009 and has quickly moved up in our top 10, settling into 2nd position this year. Responding to a looming domain seizure the site moved from its kat.ph domain to Kickass.to last August. Despite domain troubles and blockades by Internet providers in the UK and Italy, the site continues to grow. Torrentz has been the leading BitTorrent meta-search engine for many years. Unlike the other sites featured in the list Torrentz does not host any torrent files, it merely redirects visitors to other places on the web. The site uses several domain names with .eu being the most popular. ExtraTorrent continues to gain more traffic and has moved up again in the top 10, now placed as the 4th most-visited torrent site. This success didn’t go unnoticed by rightsholders groups such as the MPAA who recently called out ExtraTorrent as one of the top pirate sites. The site was forced to trade in its .com domain for .cc this year, after it was suspended by its domain registrar. Roughly three years ago nobody had ever heard of YIFY but today the movie release group is one of the most recognizable movie piracy brands on the Internet. This reputation resulted in a court-ordered ISP blockade in the UK last year. Unlike the other sites in the top 10, TV-torrent distribution group EZTV is a niche site specializing in TV content only. Because of its focus, EZTV’s traffic varies in line with the TV seasons. 1337x focuses more on the community aspect than some competitors. The site’s owners say they launched 1337x to “fill an apparent void where it seemed there was a lack of quality conscience ad free torrent sites with public trackers.” In common with most other sites in the top 10, 1337x.org is currently blocked by the larger UK Internet providers. Isohunt.to was launched last October, less than two weeks after isoHunt.com shut down. The site is not affiliated with the old isoHunt crew but copied the site’s design. This has not been without success, as the site now has millions of pageviews a day. BitSnoop is one of the largest BitTorrent indexes, claiming to index a massive 21,437,061 torrent files at the time of writing. The site’s torrents list continues to grow steadily, as do the number of DMCA notices that it receives. RARBG, which started out as a Bulgarian tracker several years ago, is the third newcomer in the top 10. Together with isoHunt.to it is the only website in the list that hasn’t been blocked in the UK, which may in part explain its popularity. Disclaimer: Yes, we know that Alexa isn’t perfect and that Compete has plenty of flaws, but combined both do a pretty good job at comparing sites that operate in a similar niche. The Alexa rank for The Pirate Bay is estimated based on the ranking of the .sx domain and isoHunt’s Alexa ranking is based on the past month only.